Howdy partner! Welcome to the Wild West, where lawlessness has broken out in GUN CITY. Trigger-happy desperado chickens have chased the righteous sheriff out of town. Nothing and no one are safe in this once-peaceful city. You're the new sheriff in town and must restore law and order by taking out these renegade chickens. In each of the three levels, the aim is to hunt as many chickens and collect as many points as possible in just 90 seconds. But be careful — the desperados shoot back! If you get shot three times, the game is over. If you shoot the wrong chicken or the wrong item, points will be deducted. Not only do you have to be accurate, but you also have to complete certain tasks in order to progress to the next level. Which tasks? You have to find that out for yourself! 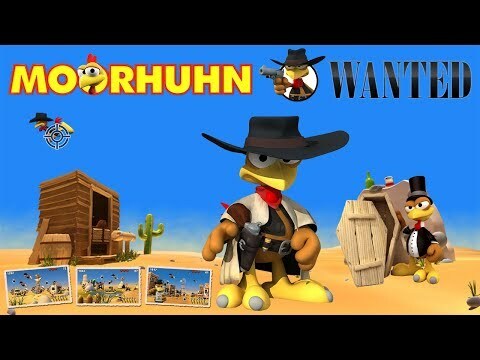 Moorhuhn Wanted was released on Switch 210d ago in the US and the UK. Notify me when Moorhuhn Wanted is available.